*David Parson, owner of Clearwater Pump Services, will open a store that sells irrigation equipment on March 4 in the building where his crew currently operates. From Cornelius garage to Forest Grove storefront: Q&A with Clearwater Pump Services owner David Parson. When David Parson went on a call to repair a woman’s pumps, he was surprised to hear the woman ask if he were related to Wilbur, his grandfather. Parson, who started fixing pumps in high school, had worked in his family’s business before starting his own in 2012. The woman explained that Parson’s grandfather had helped her fix a pump 15 years ago. Parson looked just like him. Since November, Parson and his five-person crew have operated his irrigation repair and installation business, Clearwater Pump Services, out of the 6,000 square-foot industrial building on Douglas Street in Forest Grove. On March 4, the 35-year-old will open a store that sells irrigation equipment. The Forest Grove Leader caught up with Parson on Wednesday to see how the business is doing. Q: How did you start your own pump service? *Rios, Edwin. 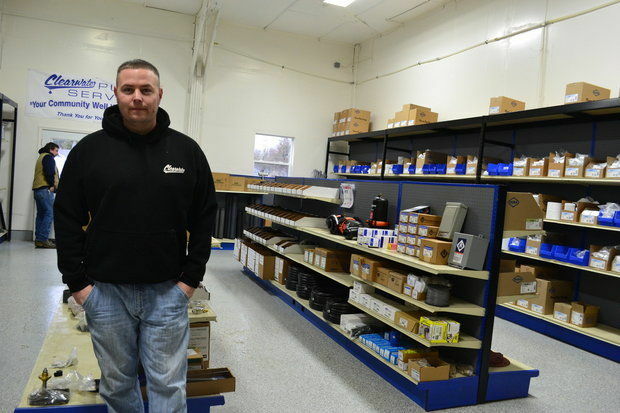 “From Cornelius garage to Forest Grove storefront: Q&A with Clearwater Pump Services owner David Parson.” Oregonlive.com – Foodday February 20, 2014.